We offer a diverse selection of rustic cabins and all twenty of them are each available separately. Each of the bunkhouses has a different capacity and mood. The Stage House, the smallest of the four sleeps eight and is very utilitarian. The Road House is accessible directly from our entrance road and parking is at the doorstep. It sleeps twelve and offers two separate sleeping areas, and a common area in the center of the structure. The Infirmary, so named because of the function it served during the CCC era, is the only cabin equipped with it’s own small bath room and shower. It has been fitted with ten bunks and sports a kitchenette with a small refrigerator and microwave. The Mansion House has a wonderful masonry fireplace, a very large central common area, and sleeping quarters on either end. It has twenty bunks. All the bunkhouses have a covered porch. We also offer 16 cabins clustered in two groups of eight. The Hill Cabins are located the closest to the Lodge and Bathhouse on a rise to the north. The Lake Cabins, a little further to the west, have a view of the lake. 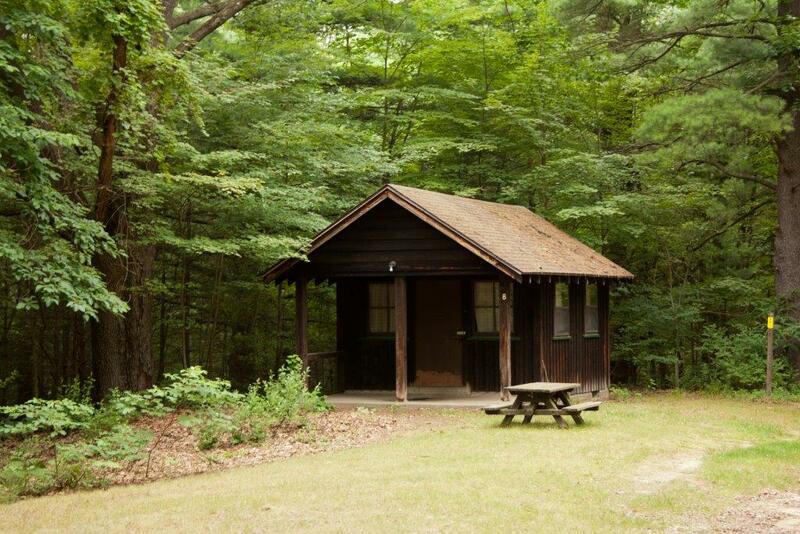 In each group of cabins there are two counselor cabins that sleep 4, and 6 cabins that sleep 5. *All the cabins and bunkhouses have electricity, screened windows and covered porches. The bunkhouses and Hill Cabins have propane furnaces. These are also available separately and provide a wonderfully informal retro atmosphere in which you can hold your business meeting, company party, club meetings or a hundred other functions. The Lodge and Kitchen are attached, but distinctly separate rooms, connected with two swinging doors to accommodate buffet style food serving. The building is of timber frame (post and beam) construction with open beam cathedral ceilings, and with windows completely surrounding the perimeter. A large covered porch off the front of the Lodge provides shade and a cool breeze. The windows provide excellent ventilation. The Lodge is quite spacious, and has a seating capacity of 120 people.There are two huge masonry fireplaces, one at either end, that have no problem heating the building on chilly days, and we plan to add central heat in the near future. 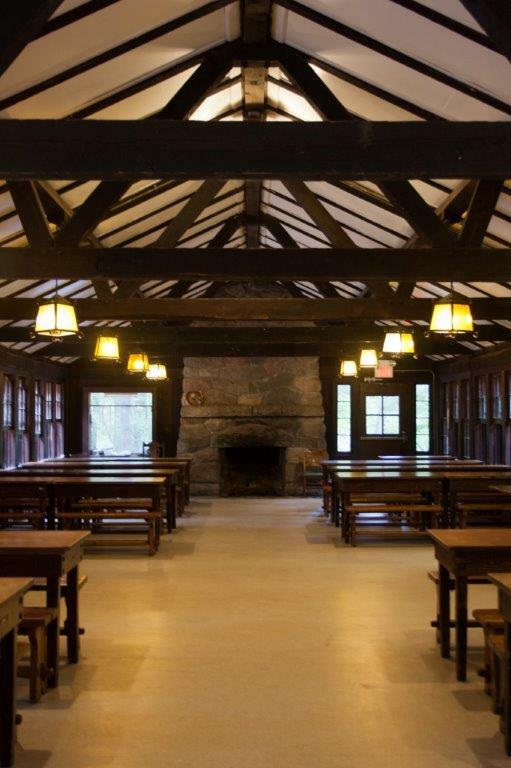 The dining tables and benches were all built on site during the construction of the Lodge and are very well preserved. The Kitchen is equipped with a hooded South Bend commercial 6 burner gas range with a large grille and four ovens, a walk-in cooler, walk-in pantry, chest freezer, commercial beverage cooler, all stainless food prep counters and sinks, central stainless island with overhanging utensil rack, table service for 120+ guests, and all the extra large pots, pans, baking sheets, cooking utensils and etc. 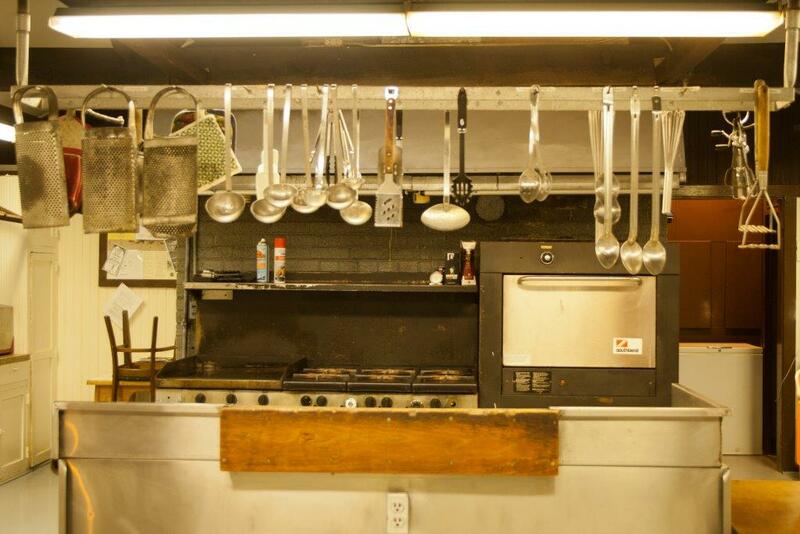 that you would expect in a commercial kitchen. A buffet counter at the end of the Kitchen nearest the Lodge makes serving a snap, and a loading dock at the rear is adjacent to the cooler and pantry saving steps there as well. *Cafeteria style food service provided by a licensed on-site vendor is usually available for an extra charge.